Anna graduated from University of Glasgow in 2002 and worked in mixed practice for 3 years before deciding to concentrate on small animal medicine. 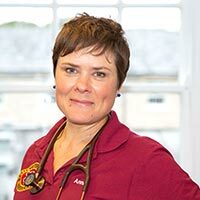 During a long stint at a busy emergency referral practice from 2009-2018, she developed a particular interest in small animal emergency and critical care cases as well as veterinary anaesthesia. She has achieved the University of Liverpool certificate in Advanced Veterinary Practice with a particular focus on these subjects. Anna’s time is mostly taken up with her two beautiful (sometimes frustrating!) young daughters but when she does have some spare time, she likes to garden and ride her bike.